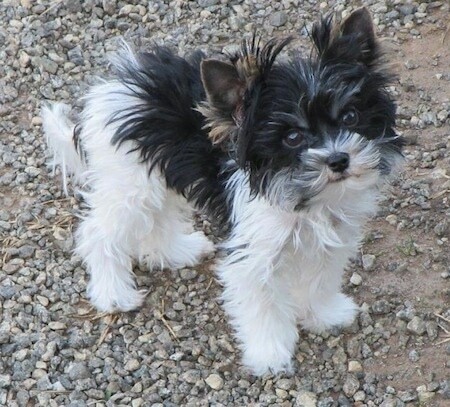 The Biewer Terrier’s body is that of a long-haired toy terrier whose hair hangs evenly and straight down the side of the body and from the base of the skull to the end of the tail. The animal should be very compact and neat. The tail should be carried up. The outlines should give the impression of a powerful and well-proportioned body. 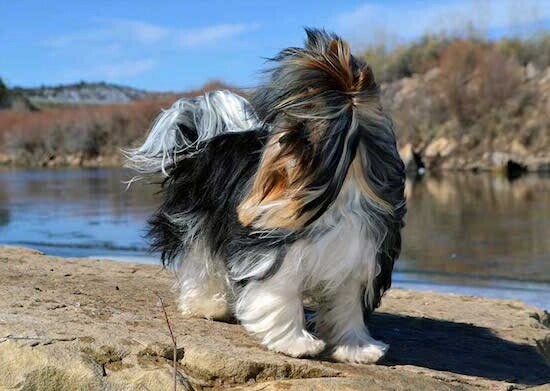 The hair on the body has a length of ¾ down the sides of the dog, or long enough to reach the ground, and is absolutely straight (not wooly), shiny like silk and of fine silky texture, without an undercoat. Coloring of the coat of the trunk and the head piece are as follows: rather white or blue-white broken or closely blue absolute, or black without brown coloring. Pure white hair on the breast, belly and legs. The head is symmetrical colored white-blue-gold. A Biro Yorkshire Terrier is when a Biewer Terrier has a lot of dark chocolate color on a white background. The Biewer Terrier tends to have a sensitive stomach, but with a good diet and controlled treat distribution, it does well. These are active little dogs that need a daily walk. Play will take care of a lot of their exercise needs, however, as with all breeds, it will not fulfill their primal instinct to walk. Dogs that do not get to go on daily walks are more likely to display behavior problems. If your Biewer Terrier zooms around the house like a speeding bullet, it is a sign that he needs to go on more/longer walks where he is made to heel beside or behind the human. Remember, in a dogs mind, the leader leads the way. They will also enjoy a good romp in a safe open area off lead, such as a large, fenced-in yard. 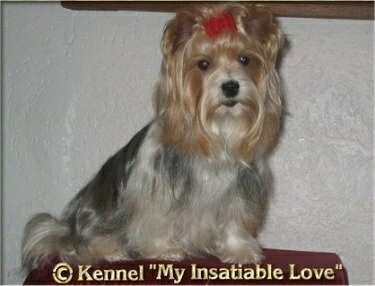 As a companion most owners prefer to have this breed in a "perpetual puppy cut." A bath at home about every two to three weeks will maintain a healthy coat if it is combed out with a wire comb once a week. Show Coat: The Biewer Terrier will develop a coat that reaches the ground. Some breeders wrap the coat to produce a very impressive elegant floor-length coat for the show ring. Their coat is very similar to human hair, but it is not suggested to use human shampoo as dogs have a different pH than humans. Using human shampoo can result in dry, itchy, flaking and sometimes allergic reactions in their skin. It is best to always brush the Biewer that has been sprayed with a light mixture of conditioner and water. Never brush a Biewer Terrier when it is completely dry as it may damage the coat. Ears should stand erect as young puppies. To keep them erect they must be trimmed every few weeks. By beginning about 1/3 of the way down from the top of the ear, carefully snip or shave, with a trimmer finisher, the hair from the inner and outer ear surfaces. 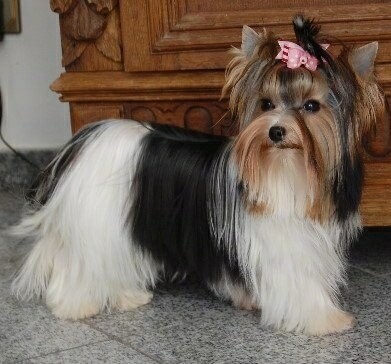 The Biewer Yorkie was originally a piebald genetic recessive gene occurrence from two Yorkshire Terriers. 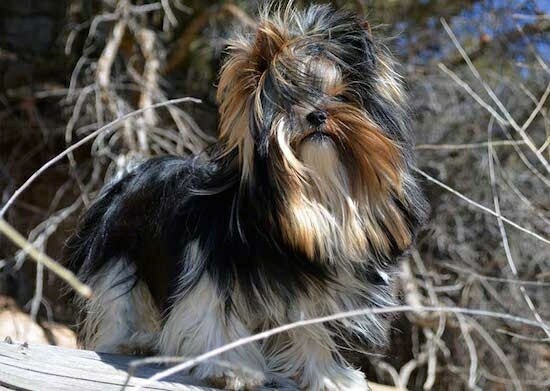 It originated in Germany on January 20, 1984 from a breeding by Gertrud and Werner Biewer's Yorkshire Terriers. In this particular litter they produced a piebald Yorkie puppy from a genetic recessive gene. This piebald puppy's registered name was Schneefloeckchen von Friedheck (Snowflake) Sire: Darling von Friedheck, a FCI World Junior Champion in Dortmund in 1981 Dam: Fru-Fru von Friedheck, a FCI World Junior Championess in Dortmund in 1981. Gertrud and Werner Biewer found this puppy to be quite beautiful and began a selective breeding process to produce more piebald puppies. Gertrud and Werner Biewer named these Yorkies with white markings "Biewer Yorkshire Terrier à la Pom Pon." 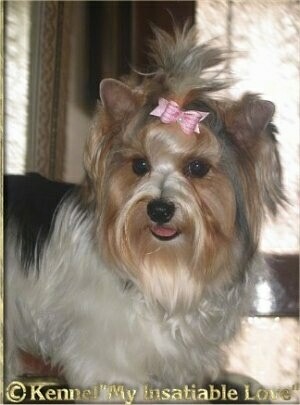 It was from these breedings the Biewer Yorkie was developed. The breed was officially recognized in 1989 by the ACH (Allgemeiner Club der Hundefreunde Deutschland - ACH e. V). 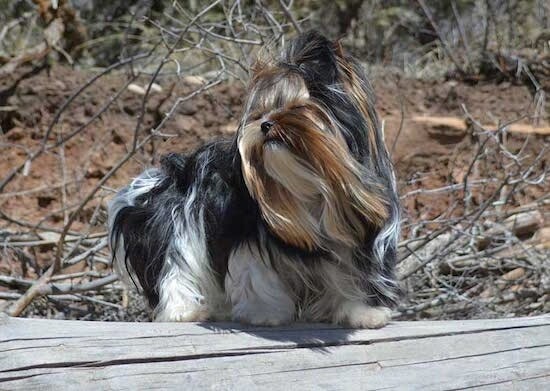 Today Yorkshire Terriers and Biewers are considered two different breeds. 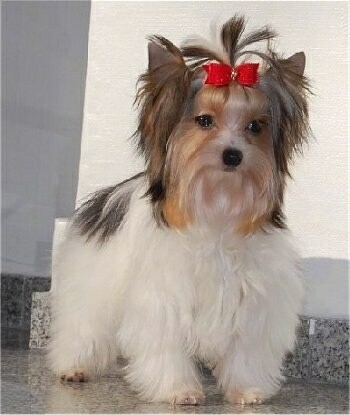 Against the wishes of some of the Biewer clubs, some American breeders are importing Biewers and crossing them with Yorkshire Terriers and calling them Biewer Yorkies. The clubs state, "Breeding back to the Yorkie is a big no-no, as purebred is NOT achieved by breeding with another breed." 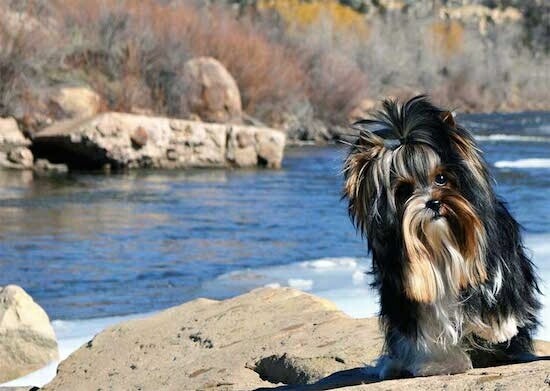 A hybrid breeder who mixes the Biewer and the Yorkie states, "There can be Biewer and Yorkshire color puppies in a single litter, but only in the F2 generation. In the F1 generation, if you breed a Biewer and a Yorkshire, you get only Yorkshire color puppies (black and tan). If you keep a puppy and breed this again to a true Biewer (third generation Biewer) you will get Biewer and Yorkshire puppies. If you keep again a puppy, no matter if Yorkie color or Biewer, and breed this again to a Biewer you get only Biewer puppies." Find out more about multi-generation crosses. The BTCA states they were involved in a two-year study with the geneticists at Mars Veterinary and were able to determine that the Biewer Terrier is now a distinct breed of its own and not a tricolored Yorkshire Terrier. The BTCA has changed the Biewer's written standard and also its original name to the Biewer Terrier. The BTCA, Inc. has the only accepted revised standard signed by Mrs. Biewer. The revised standard allows for undocked tails and black in the coats. Any other standard being used was not developed with the aid of Mrs. Biewer. It is said that Mrs. Biewer agrees with the Biewer Terrier name and not the Biewer à la Pom Pon. She said the dog is a terrier and Terrier has to stay in the name. The “à la Pom Pon” was added for fun and means nothing. In April of 2014 the Biewer was accepted into the AKC/FSS (American Kennel Club Foundation Stock Service) under the name Biewer Terrier. The AKC has listed the BTCA (Biewer Terrier Club of America Inc.) as the AKC/FSS affiliate club. Some breeders disagree with these changes, stating that is not the breed's name. 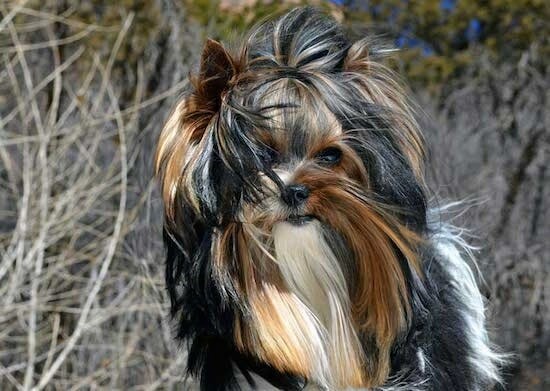 The Biewer Yorkshire à la Pom Pon is also called the Biewer or Biewer Yorkie. BBGC = Biro Biewer Golddust Club, Inc.
WRV = Westdeutscher Rasse- und Gebrauchshunde Verein e.V. 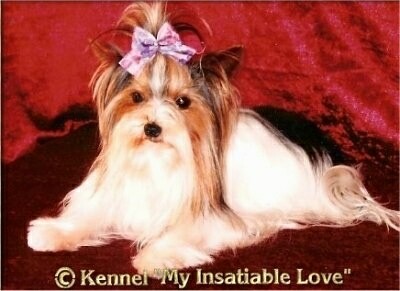 Biewer named Forever and Ever "My Insatiable Love," photo courtesy of Kennel "My Insatiable Love"
Video clip of a litter of Biewer Yorkie and Yorkie puppies playing—the tricolor puppies are the Biewers and the brown and black puppies are the Yorkshire Terriers. Biewer named Fabulouse Baker Boy "My Insatiable Love," photo courtesy of Kennel "My Insatiable Love"
Paddy "vom alten Turm" weighing 3.3 pounds, photo courtesy of Kennel "My Insatiable Love"
Chayenne the Biewer weighing 5.6 pounds, photo courtesy of Kennel "My Insatiable Love"
Dolly the Biewer weighing 5.7 pounds, photo courtesy of Kennel "My Insatiable Love"
Penelope the Biewer weighing 6 pounds, photo courtesy of Kennel "My Insatiable Love"
Luke the Biewer Yorkshire Terrier at 7 months old—"This is Luke From LPC Biewer Terriers. He is so sweet and full of personality. I hope to get him certified to become a therapy dog to take to hospitals and nursing homes."